But seriously, this is fake. Anyone who spoils any bit of The Wire is deserving of instant death. The removal of equipment gag was top notch. Well done yet again, DGB. Well done, sir. Although it feels a little weird that the image captions are becoming my favorit part of your posts. Just about died laughing. This is awesome. I really gotta stop reading these in class...fantastic again! Amazing. Really great writing, and very funny. Seriously, just because the fish is already in a barrel doesn't mean you shouldn't shoot it. The limousine line kept me laughing for about a minute... The NHL will never be boring as long as Kane and Avery are around. Don't forget to fight to protect Chrissy Pronger from your team's puck bag. kyle wellwood = overweight class? 5 star effort! 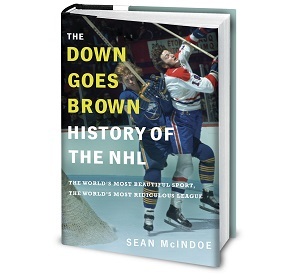 I loved the references to Patrick Kane and Sean Avery. Although, you should have included a Chris Pronger joke like you usually do. Also, going on and on about "The Walking Dead," even though it's derivative and overhyped, shall result in a beating and a 5 minute major. Great blog! 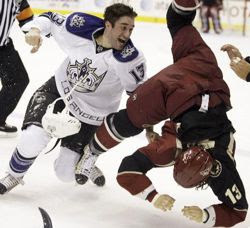 The most entertaining part of hockey fights is how so many commentators, especially if you've ever listening to the American braodcasts, always talk about how fighting needs to be stopped. They say there is 'no place' for it in the game, but every time a fight breaks out the crowd gets fired up and both teams pick up their game. Even the commentators get way more excited when they are announcing it. I loved the "being Sean Avery" comment in the "punishable acts" Ha!